Introduction: One of the aims of root canal treatment is to prevent or eliminate pain. Postoperative endodontic pain control continues to be a significant challenge. Aim: To compare and evaluate the effect of single oral dose of 100 mg of tapentadol, 400 mg of etodolac, or 10 mg of ketorolac as a pretreatment analgesic for the prevention and control of postoperative endodontic pain in patients with symptomatic irreversible pulpitis. The incidence of side effects was recorded as secondary outcome. Materials and Methods: Sixty emergency patients with moderate to severe pain, diagnosed with symptomatic irreversible pulpitis were randomly allocated (1:1:1) to any of the three groups; tapentadol, etodolac, or ketorolac. Medications were administered 30 min before beginning of the endodontic treatment. Patients recorded pain intensity on 10 cm visual analog scale (VAS) after treatment, for upto 24 h.
Results: At 24 h, mean ±standard deviation (SD) of VAS scores (in cm) for tapentadol, etodolac, and ketorolac were 0.89 ± 0.83, 2.68 ± 2.29, and 0.42 ± 0.69, respectively. Kruskal-Wallis (K-W) test showed significant difference among the three groups (P = 0.001). Mann-Whitney test showed significantly lower VAS scores in tapentadol and ketorolac than etodolac group (P = 0.013 and 0.001, respectively). Conclusions: Single oral dose of 10 mg of ketorolac and 100mg of tapentadol as a pretreatment analgesic significantly reduced postoperative endodontic pain in patients with symptomatic irreversible pulpitis when compared to 400 mg of etodolac. Many opioids still possess issues of drug dependency, withdrawal symptoms, and seizure-like side effects. Tapentadol is a centrally acting opioid analgesic with two modes of action, combining μ-opioid agonist and norepinephrine reuptake inhibition (NRI) in a single molecule with the rationale to produce an opioid-sparing effect. But this promising analgesic has not been tested much in endodontic pain models. The purpose of this study was to evaluate postoperative pain in patients diagnosed with symptomatic irreversible pulpitis, receiving endodontic treatment after pretreatment analgesia with single oral dose of either 100 mg of tapentadol, 400 mg of etodolac, or 10 mg of ketorolac for the management of postoperative endodontic pain. Null hypothesis tested was that there exists no significant difference among the three groups in postoperative endodontic pain management. This research protocol was approved by the Institutional Ethical Committee. Patients reporting to the postgraduate endodontic clinic from 11 September 2012 to 05 February 2013, within the age group of 18-60 years were enrolled for the study. Demographic details and thorough case history was recorded with stress on medical and drug histories. Clinical examinations, including thermal (cold) test, electrical pulp testing, periodontal assessments, and radiographic examinations were performed. Sixty patients diagnosed with symptomatic irreversible pulpitis in multirooted teeth with baseline pain scores greater than 3 cm on visual analog scale (VAS) were included in the study. Exclusion criteria were any drugs taken within the last 8 h;patients under any currently acting analgesics; patients with any systemic or mental illness, pregnant or lactating mothers; patients with acute endodontic abscess, periodontal diseases, and retreatment cases; and any known allergy or sensitivity to the study groups. Selected patients signed an informed consent prepared on World Health Organization (WHO) Guidelines,  which outlined the study procedure. A sample size of 17 patients per group was calculated based on the results of the pilot study to achieve 95% confidence interval (two-sided) and 90% power of the study. Considering the dropouts, a final sample size of 20 patients per group was decided. The selected patients were randomly assigned (1:1:1) [Figure 1] to any of the three study groups: Group 1- tapentadol (Tydol 100 mg - Ranbaxy Laboratories Ltd), Group 2- etodolac (Etura 400 mg - Dr Reddy's Pvt Ltd), and Group 3- ketorolac (Ketanov 10 mg - Ranbaxy Laboratories Ltd). Single oral dose of medication was provided 30 min before the initiation of endodontic therapy. Food intake was withheld for next 3 h and patients were allowed only drinking water, so as to prevent injury to the oral tissues by biting on the areas that are anesthetized. In this clinical trial, all medications were sealed in coded packets by a staff nurse, who was blinded to the aim and research protocol. All the drug packets were coded with randomly generated area pincodes of six digits on Microsoft Excel Sheet 2007. The packets were maintained by an investigator, who was blinded to the drugs and the coding protocol. He supervised the patients while taking the oral medications. Endodontic therapy, in all cases was performed by an endodontic postgraduate resident who was also blinded to the coding protocol. Each patient was anesthetized with 2ml of xylocaine 2% with adrenaline 1:200,000, AstraZeneca, India followed by rubber dam isolation and access cavity preparation. Working length was determined with Root ZX mini apex locator (J. Morita, USA) and periapical radiographs. Cleaning and shaping was done using passive step-back technique to enlarge the canal to a minimum apical size of #30 file or larger depending on the size of the canal. Sodium hypochlorite (2.5%) and normal saline were used as irrigants. Finally, canals were dried with paper points and the access cavities were restored temporarily with Cavit (3M ESPE, St Paul, MN, USA). Each patient was provided with a postoperative pain questionnaire having VAS and side effect chart. Patients were encouraged to make immediate postoperative pain measurement (0 h) in order to ensure patient understanding of the pain questionnaire. Patients were instructed to complete the questionnaire at 0, 6, 12, 18, and 24 h after completion of root canal treatment. Pain intensity was recorded using VAS, which consisted of a 10-cm line anchored by two extremes, "no pain" and "pain as bad as it could be". Patients were asked to make a mark on the line that represented their level of perceived pain. All common side effects mentioned by drug manufacturers were included in the side effect chart as none, mild, moderate, and severe. Side effects included were nausea, vomiting, diarrhea, constipation, heartburn, stomach pain, dizziness, headache, drowsiness, skin itching, and blurred vision. Patients were also provided with escape medication (Tab. Ibugesic 600 mg, Cipla Ltd, India) and were instructed to take medication in case of severe pain and report immediately. However, these patients were excluded from the analysis [Table 1]. All the statistical calculations were made through the Statistical Package for Social Science (SPSS) version 17. The three test groups were compared at baseline for age using one-way analysis of variance (ANOVA); for gender and tooth location using Pearson chi-square test; and for VAS score of preoperative pain using Kruskal-Wallis (K-W) test. To compare VAS scores of the three test groups at 0, 6, 12, 18, and 24 h; K-W test was applied. When K-W test showed significant difference, Mann-Whitney U test was applied for pairwise comparisons. P-value less than 0.05 was considered statistically significant. However, as the number of patients who reported side effects were very less [Table 2], no statistical tests could be performed. [Table 1] shows the number of patients analyzed (n = 56) and the number of patients excluded (n = 4) from the analysis. These were excluded because of the homogeneity of noncompliance between the study groups and lack of evidence of severity of pain scores amongst them. The number of noncompliance samples was almost equal amongst the groups. Otherwise, excluding the noncompliance samples was not allowed. The analysis was carried out on the VAS scores of 56 fully compliant samples with demographic data. No significant differences were seen among the three groups with respect to preoperative pain scores, age, gender, and tooth location; as shown in [Table 3]. All patients reported postoperative pain at the 0, 6, 12, 18, and 24 h time intervals. 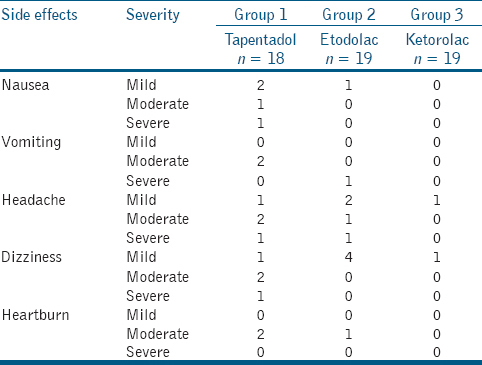 [Table 4] shows the mean and standard deviations (SDs) of VAS scores for tapentadol, etodolac, and ketorolac at different time intervals. 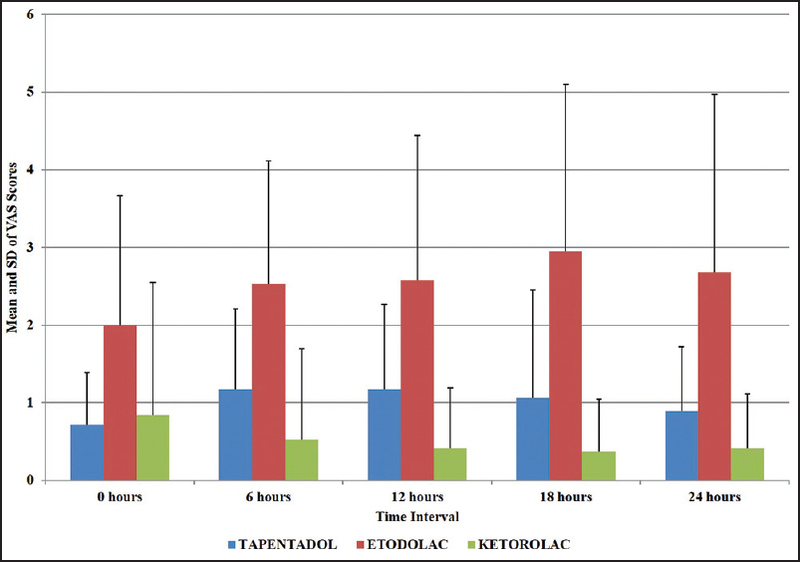 At 0 and 24 h, the VAS scores of tapentadol and ketorolac groups were significantly lower than etodolac group. 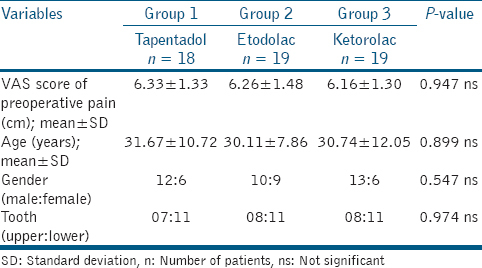 At 6, 12, and 18 h;ketorolac group showed significantly lower VAS scores than tapentadol group; and VAS scores in tapentadol and ketorolac groups were significantly lower than etodolac group [Figure 2]. [Table 2] shows number of patients reporting incidence of side effects. Postoperative endodontic pain control continues to be a significant challenge. Amongst all dental procedures, endodontic treatment produces more frequent and severe postoperative pain. Endodontic treatment itself can trigger production of prostaglandins due to the trauma of severing the pulp and the irritation of the periodontal ligament (PDL) subsequent to establishing patency, cleaning, and shaping. This inflammatory process in the periradicular areas of the tooth after treatment can produce postoperative pain. Moreover, postoperative pain is more likely to occur within the first 24 h following endodontic treatment. Management of postoperative pain is multifactorial and should be aimed at reducing the peripheral and central components of hyperalgesia with endodontic and pharmacological therapy. Results of the present study demonstrate that pretreatment analgesia with ketorolac significantly decreased postoperative endodontic pain when compared to tapentadol and etodolac at 6, 12, and 18 h. Tapentadol and ketorolac were significantly better than etodolac at 0 and 24 h, but no significant difference was found between both of them. Etodolac showed significantly higher VAS scores. This finding may suggest that etodolac might not have a high affinity for the inflammatory components of an endodontic pain in comparison to ketorolac and tapentadol. None of the medications showed any higher incidence of side effects [Table 2] and were relatively safe. Within the limitations of the study, pretreatment analgesia with single oral dose of 10 mg of ketorolac and 100 mg of tapentadol when given 30 min before endodontic treatment showed substantial reduction in postoperative pain when compared with 400 mg of etodolac. This might be helpful to prevent postoperative endodontic pain, especially in patients with a low pain threshold. Further studies examining different clinical conditions, single- versus multiple-visit endodontic treatment, modes of drug delivery, and use of immediate release and sustained release drugs should be carried out to elucidate the potential of these drugs in the context of endodontic pain. The authors thank Dr. Sudhanshu Saxena, Reader, Dept. of Public Health Dentistry, Peoples College of Dental Sciences and Research Centre, Bhopal, India for statistical analysis. Marshall JG, Walton RE. The effect of intramuscular injection of steroid on posttreatment endodontic pain. J Endod 1984;10:584-8. Liesinger A, Marshall FJ, Marshall JG. Effect of variable doses of dexamethasone on posttreatment endodontic pain. J Endod 1993;19:35-9.
van Wijk AJ, Hoogstraten J. Reducing fear of pain associated with endodontic therapy. Int Endod J 2006;39:384-8.
van Wijk AJ, Duyx MP, Hoogstraten J. The effect of written information on pain experience during periodontal probing. J Clin Periodontol 2004;31:282-5. Attar S, Bowles WR, Baisden MK, Hodges JS, McClanahan SB. Evaluation of pretreatment analgesia and endodontic treatment for postoperative endodontic pain. J Endod 2008;34:652-5. Dionne RA, Campbell RA, Cooper SA, Hall DL, Buckingham B. Suppression of postoperative pain by preoperative administration of ibuprofen in comparison to placebo, acetaminophen, and acetaminophen plus codeine. J Clin Pharmacol 1983;23:37-43. Gopikrishna V, Parameswaran A. Effectiveness of prophylactic use of rofecoxib in comparison with ibuprofen on postendodontic pain. J Endod 2003;29:62-4. Holstein A, Hargreaves KM, Niederman R. Evaluation of NSAIDs for treating post-endodontic pain. Endod Topics 2002;3:3-13. Doroschak AM, Bowles WR, Hargreaves KM. 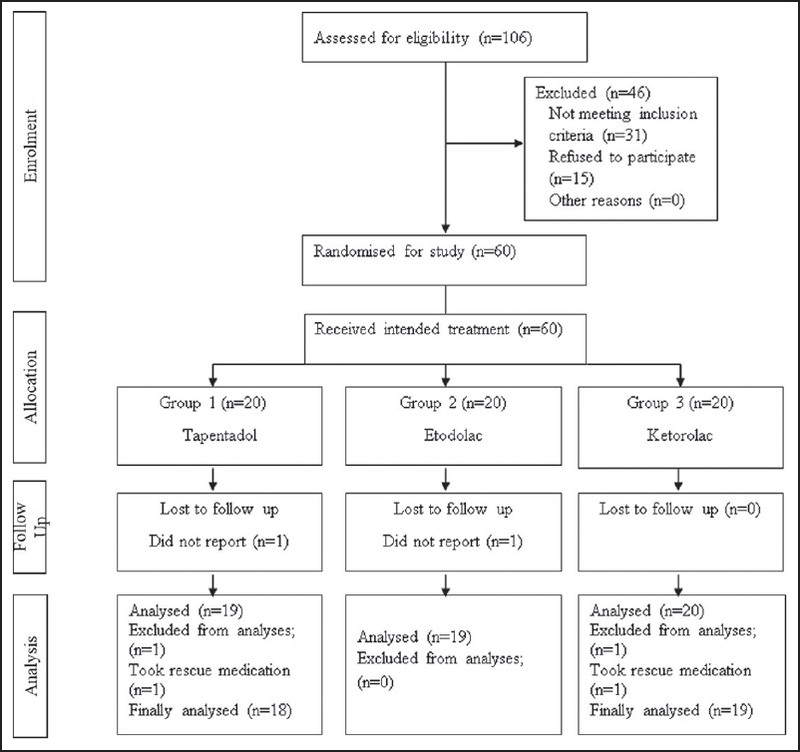 Evaluation of the combination of flurbiprofen and tramadol for management of endodontic pain. J Endod 1999;25:660-3. Penniston SG, Hargreaves KM. Evaluation of periapical injection of Ketorolac for management of endodontic pain. J Endod 1996;22:55-9. Mehrvarzfar P, Abbott PV, Saghiri MA, Delvarani A, Asgar K, Lotfi M, et al. Effects of three oral analgesics on postoperative pain following root canal preparation: A controlled clinical trial. Int Endod J 2012;45:76-82. Comfort MB, Tse AS, Tsang AC, McGrath C. A study of the comparative efficacy of three common analgesics in the control of pain after third molar surgery under local anaesthesia. Aust Dent J 2002;47:327-30. Laine L, Sloane R, Ferretti M, Cominelli F. A randomized double-blind comparison of placebo, etodolac, and naproxen on gastrointestinal injury and prostaglandin production. Gastrointest Endosc 1995;42: 428-33. Gillis JC, Brogden RN. Ketorolac. A reappraisal of its pharmacodynamic and pharmacokinetic properties and therapeutic use in pain management. Drugs 1997;53:139-88. World Health Organization [Internet]. Geneva: The Organization; c2014. Informed Consent Form Templates. Available from: http://www.who.int/rpc/research_ethics/informed_consent/en/ [Last accessed on 2014 Jan 18]. The Reach Institute [Internet]. New York; c2012. Medication Dosing Charts & Side Effects. Available from: http://www.thereachinstitute.org/medication-charts.html [Last accessed on 2014 Jan 18]. Levin L, Amit A, Ashkenazi M. Post-operative pain and use of analgesic agents following various dental procedures. Am J Dent 2006;19:245-7. Siqueira JF, Barnett F. Interappointment pain: Mechanisms, diagnosis, and treatment. Endod Topics 2004;7:93-109. Menhinick KA, Gutmann JL, Regan JD, Taylor SE, Buschang PH. The efficacy of pain control following nonsurgical root canal treatment using ibuprofen or a combination of ibuprofen and acetaminophen in a randomized, double-blind, placebo-controlled study. Int Endod J 2004;37:531-41. Flath RK, Hicks ML, Dionne RA, Pelleu GB Jr. Pain suppression after pulpectomy with preoperative flurbiprofen. J Endod 1987;13:339-47. Johansson S, Josefsson G, Malstam J, Lindstrand A, Stenstroem A. Analgesic efficacy and safety comparison of Ketorolac tromethamine and Doleron for the alleviation of orthopaedic post-operative pain. J Int Med Res 1989;17:324-32. Forbes JA, Kehm CJ, Grodin CD, Beaver WT. Evaluation of ketorolac, ibuprofen, acetominophen, and an acetominophencodeine combination in postoperative oral surgery pain. Pharmacotherapy 1990;10:94-105. Arnold J, Salom I, Berger A. Comparison of gastrointestinal microbleeding associated with use of etodolac, ibuprofen, indomethacin, and naproxen in normal subjects. Curr Ther Res 1985;37:730. Schroder W, Tzschentke TM, Terlinden R, De Vry J, Jahnel U, Christoph T, et al. Synergistic interaction between the two mechanisms of action of tapentadol in analgesia. J Pharmacol Exp Ther 2011;337:312-20.